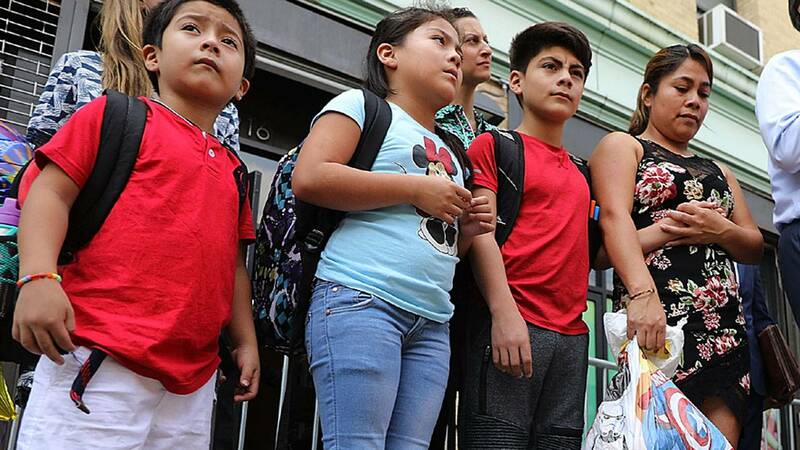 WASHINGTON (CNN) - The Trump administration on Saturday revealed its plan to make it harder for immigrants to come to or stay in the United States if they or their family may use certain public benefits. The proposed rule announced by the Department of Homeland Security could make immigrants seeking to enter the United States ineligible for visas or green cards if they are deemed likely to receive certain public benefits once they come to the country. The rule is a vast expansion of existing interpretations of what is considered a "public charge," or someone dependent or likely to become dependent on government. The "public charge" concept has a long history in immigration law, DHS noted, though the proposal would be a much broader take on it. "Under long-standing federal law, those seeking to immigrate to the United States must show they can support themselves financially," Department of Homeland Security Kirstjen Nielsen said in a statement in a DHS news release outlining the proposal. "This proposed rule will implement a law passed by Congress intended to promote immigrant self-sufficiency and protect finite resources by ensuring that they are not likely to become burdens on American taxpayers," Nielsen said. Immigration activists claimed the rule would hurt the country in the long run. "Today's announcement by the Trump Administration is a backdoor, administrative end-run to substantially reduce legal immigration that, if implemented, will hurt our entire country," said FWD.us President Todd Schulte. "This policy will cost the United States in the long run by limiting the contributions of hardworking immigrants who could become legal residents, and no one is better off because of it. The proposed changes would create a subjective criteria and overly-bureaucratic process when making a public charge determination. It is another underhanded attempt to force cuts to legal immigration, ultimately hurting our communities and country." Marielena Hincapié, executive director of the National Immigration Law Center, issued a statement critical of the news on Saturday following reports on the proposed rule. "How you contribute to your community --- and not what you look like or the contents of your wallet --- should be what matters most. This proposed rule does the opposite and makes clear that the Trump administration continues to prioritize money over family unity by ensuring that only the wealthiest can afford to build a future in this country," Hincapié said. Melissa Boteach at Center for American Progress also criticized the proposal, telling CNN, "This is an attack on working families and says that you would have to achieve the American dream somewhere else before you even come here." The rule has been in development for months and was pushed forward strongly by White House adviser and immigration hardliner Stephen Miller, sources told CNN. The proposal has been with the White House for review since March. Concerns over potential lawsuits delayed the final rule, and the draft underwent numerous revisions, multiple sources told CNN.